For as long as he can remember, Asher has possessed unexplainable abilities, which his widowed father has forced him to keep hidden. But when an elusive girl named Scar enters his village, Asher's life is forever transformed. Bound by despair, the teens plot to run away. However, when a mystical medallion finds its way into Asher's hands, they soon learn that running is not an option, it's imperative. Asher is thrust into the pursuit of a legendary treasure, believed to possess the power to save the world from the prophesied apocalypse. And the key to unlocking this power lies within the secret of his curse. While hunted by dark forces, Asher realizes that Scar has secrets of her own; she is not the girl he thought she was. Time is running out as he struggles to find the strength to let go of his feelings and summon the courage to embrace his destiny. A chilling, heart-wrenching tale of colliding worlds and forbidden love, The Vyne reinvents steampunk-fantasy for a whole new generation. Absolutely beautiful and chilling. I love the blues and blacks that blend so seamlessly together. What a way to start a book! Wow! I am so in! For those of you who don't often read Steampunk/Fantasy novels, let me tell you something outright. Before this review even begins. Characters are numerous, and if you are a character heavy reader, chances are you won't really connect with them. You might enjoy a character, or think they are interesting, but it's really unlikely you'll ever get to know so much about a character that you know them. I guess. I mean as much as you would get to know them in say, a Contemporary read. Unless there are multiple books. I've experienced this many times and I just take it as law when I pick up a book in this genre. That being said, I loved reading The Vyne. The world that Daniel Walls builds for his readers is equally beautiful and terrifying at the same time. In fact, I was so immersed in the words on the pages, so intent on seeing what was going to happen with Asher and Scar, that I didn't realize that clock said 2am. I was so impressed with the way that the story progresses and gives you just enough to keep you reading on until the next chapter. Yes my friends, this book kept me awake way into the wee hours of the morning. I wouldn't have it any other way. As I mentioned above, I didn't really connect with Asher and Scar as characters per say, but I did really enjoying following their adventures. Asher is a bit crass and hard at times, but it was easy to see why based on how he was brought up. That and his nightmares would be more than enough to create a hardened outer shell. Although he isn't a "snuggly" character I thought he was fascinating. As for Scar, she's a bit odd. A clone of sorts, so not really human, she picks up more and more human emotions as the book progresses. I was a tiny bit lost with her, but once her adventure with Asher really took off it didn't even matter anymore. 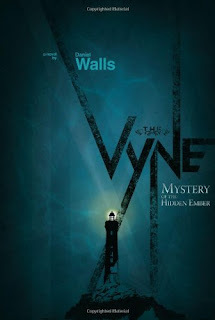 A dark and entangling adventure, complete with a bit of a romance, The Vyne was a book that I really enjoyed reading. I think that if you, my reader friends, go into the book understanding that this is a different kind of read (more adventure and less emotion) you'll enjoy it immensely as well. Go get lost in the world that Daniel Walls has built for you. You won't regret it.